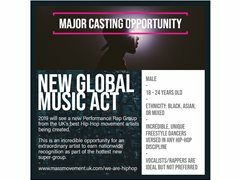 In 2019, an Independent Record/Management Company, set-up by ex-A&R Director of Big Life Records, is looking to create a new Performance Rap Group from the UK’s best Hip-Hop movement artists. With a record deal in sight, brand endorsements and media exposure, this is an incredible opportunity for an extraordinary artist to earn nationwide recognition as part of the hottest new super-group. If you’re an extraordinary hip-hop artist looking to be a part of the next big thing, this is your chance to audition and showcase your greatest abilities for this one-off opportunity. You will feature as part of an elite line-up of hip-hop performers, all signed as leading artists within a super-group and reaping the rewards that come with it. Professional / Street Dancers versed in any hip-hop discipline/urban styles. Vocalists/Rappers are ideal but not essential.